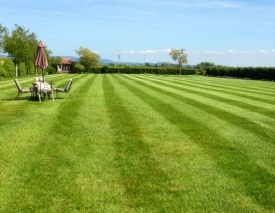 We specialise in lawn care but also carry out many other garden maintenance and landscaping services across Lancashire. Many of our clients have different reasons for requiring our services. We have found many people love their garden and feel that there are great rewards to be had from getting things done in the garden. Still, we find that many people also realise that in this modern era, they don’t have enough time to dedicate to the garden as they would like to. That’s where we can really help. Whether you want help in the garden on a regular basis or need help with the seasonal garden jobs, we offer our services at reasonable and affordable prices. We find that client’s garden maintenance requirements vary hugely. Therefore we are more than happy to be guided by what you feel your garden requires. On the other hand, if you are uncertain, we can talk you through some of the options and help you prioritise what you want us to tackle first in your garden. You may be feeling that your garden is looking a bit tired and needs some real TLC. You may have been inspired by a garden design you have seen and just feel you need to inject some life into your garden with a fresh look. We really take delight in working together with our clients to help them maximise the full potential of their garden. As we carry out our work across Lancashire we have found there is a high demand for help with lawn maintenance and therefore we offer extensive services in this area. We can help with those pesky weeds and give your lawn the feed it really needs to get it looking healthy again. Many customers come to us because they find lawn care can be frustrating and overwhelming. We can set you up with a lawn care plan that will identify the problems you are having and put into effect the appropriate action needed to get you back on the path to owning a beautifully vibrant lawn. Our lawn care business does not end there as many people desire to modernise their gardens and driveways at the same time. Therefore we offer patio paving, flagging and decking services. As these also need maintenance we offer a jet washing service.